It is time once again for the Krylon Mystery Box challenge. 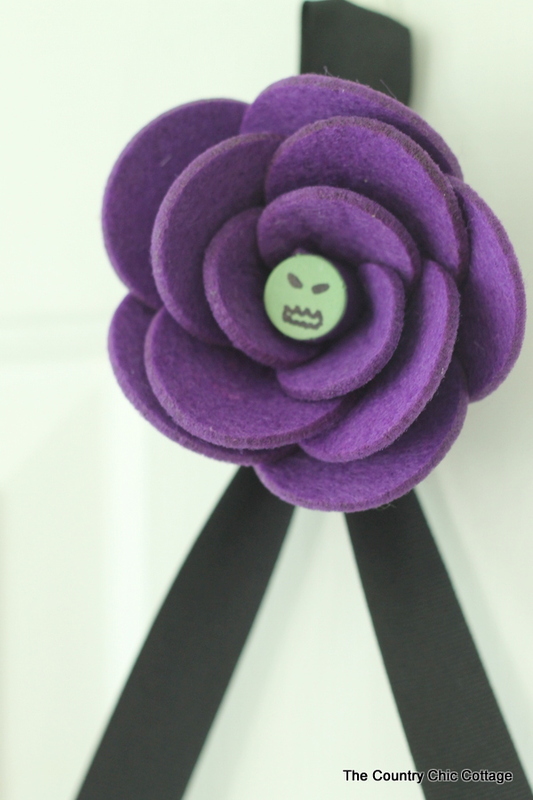 This time I made a glow in the dark Halloween wreath that is cute and spooky….at the same time! I was sent a box of mystery ingredients from Krylon as they are sponsoring this post. However you can find these same items at a craft store near you to recreate this wreath for your home. So lets get started. First of all, the mystery box shows up at my door and I have NO IDEA what is in it until I open it for myself. Oh my. This time it was a collection of seemingly random items (pictured below). I usually let the box sit for a while after opening just to let my creativity flow. I am to use at least FOUR of the items from the mystery box on my craft. 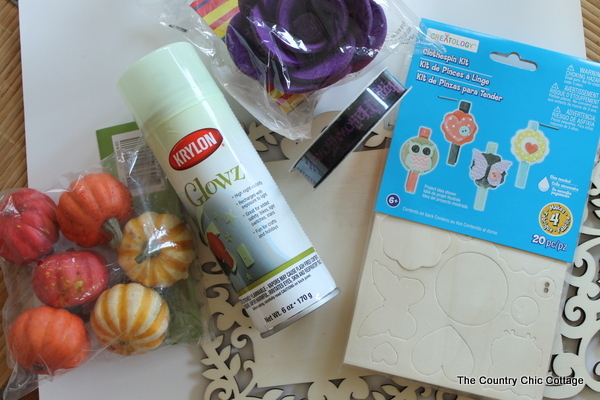 I started with the clothespin kit and sorted out the pieces I could use for a Halloween wreath. 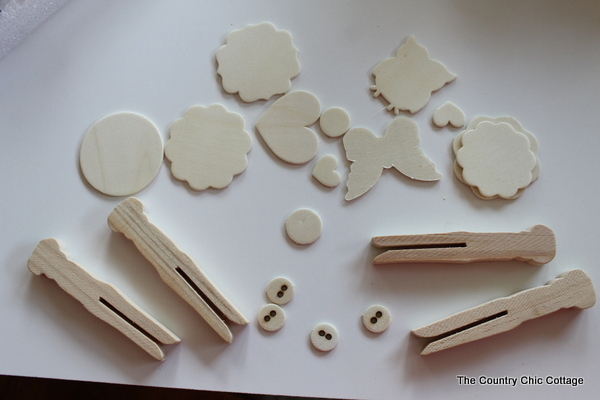 The clothespins and round pieces stayed. The rest was put away for another day. 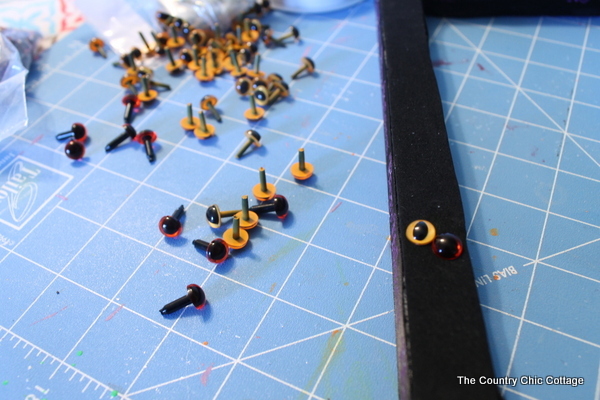 I spray painted the clothespins white then with a few coats of Glowz. The round pieces got a coat of pistachio then a few coats of Glowz. I wanted a square wreath to surround my laser cut wood frame. 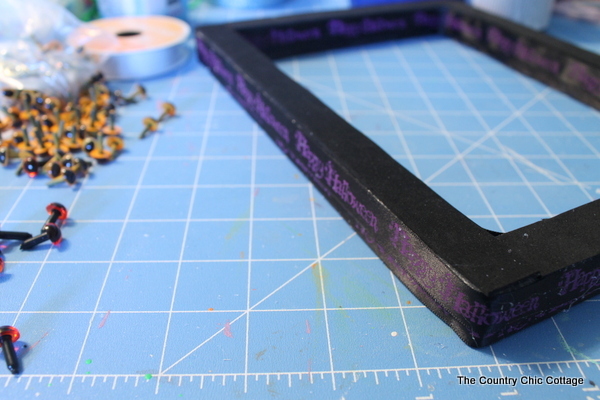 I took some measurements of the frame itself and decided on a wreath size. 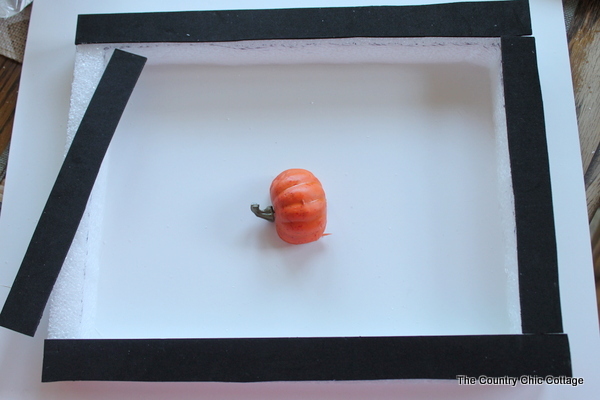 I laid that out on the Styrofoam sheet using a pencil. The Styro Cutter made short work of the wreath form. 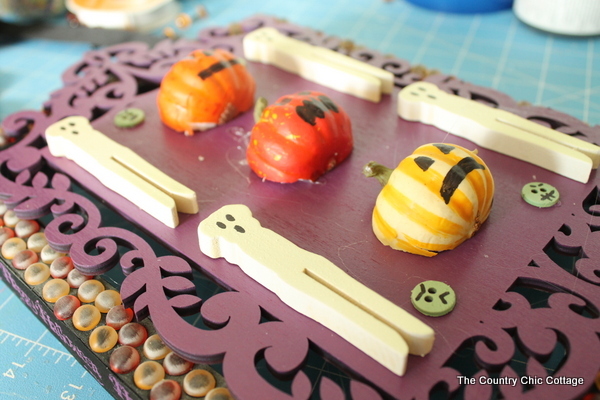 I then used a serrated knife to cut the mini pumpkins in half. 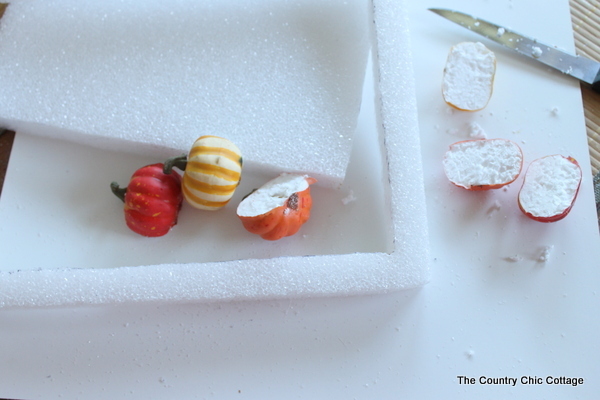 You can also use a serrated knife on the Styrofoam sheet but be prepared as it will make a large mess and be careful as it will be easy to cut too far and ruin the wreath form. I wanted the wreath form front to be black but you cannot actually spray paint Styrofoam. So I used a black foam sheet and cut it into strips. 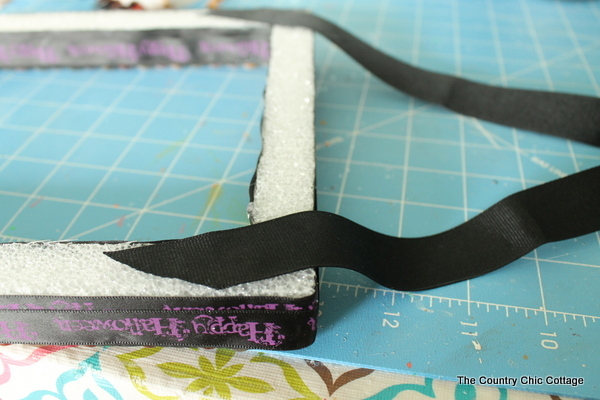 Using hot glue to secure to the front of the Styrofoam frame. 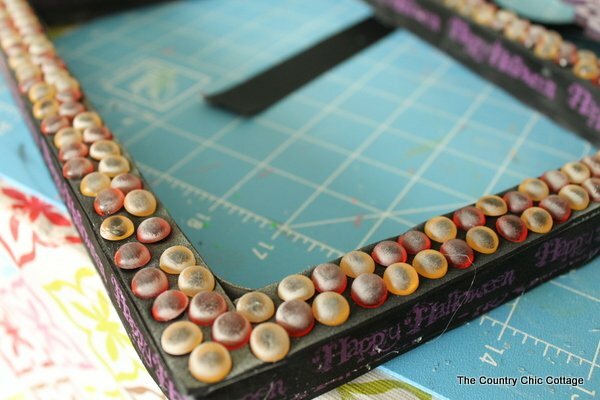 Then I used the Halloween themed ribbon to cover the outside and inside edges of the frame. I had to go around each edge twice as the ribbon was not quite as wide as the wreath form. You can then stick the animal eyes randomly into your wreath. They push right in and no further adhesive is needed. Once you fill up your wreath form it will be looking AMAZING!! Now we are going to talk a bit about do as I SAY not as I DO! I sprayed my eyes with just a little Glowz paint. It did make them glow however the effect on the eyes was not my favorite thing. I would leave OFF the Glowz paint on the eye portion of this wreath. We are also going to need a way to hang this wreath. 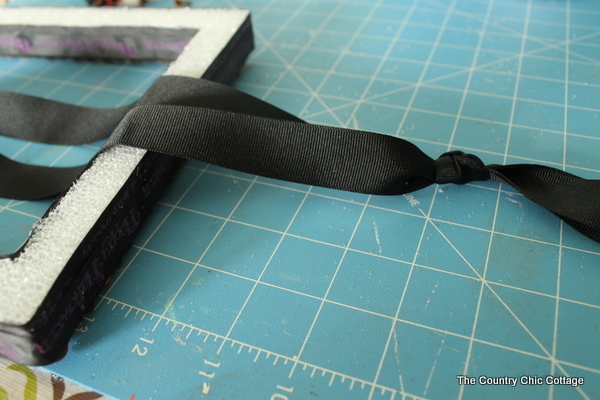 I was out of the Halloween themed ribbon so I grabbed some plain black ribbon and tied a knot to form a loop about half way. 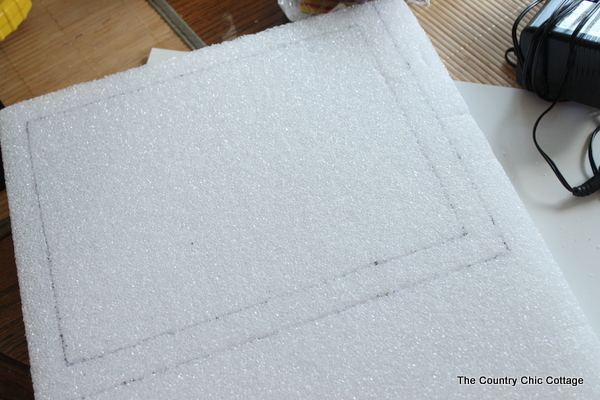 Then glue the ends to the back of the Styrofoam wreath as shown below. 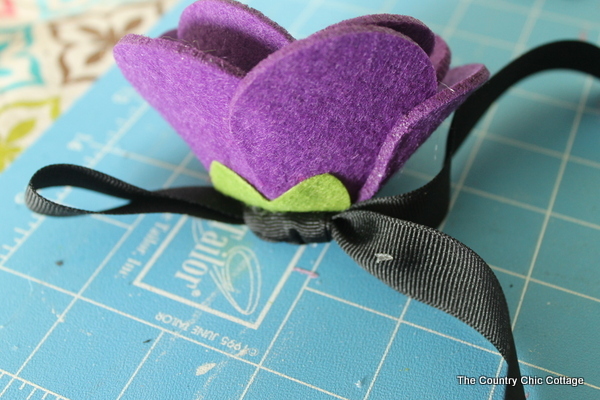 Use hot glue to add the purple felt flower to the knot as shown. I added one of my green glow in the dark wood circles to the center of the flower as well. Just draw on a monster face with a black Sharpie. Be sure to also paint the laser cut wood frame with Krylon in Rich Plum. 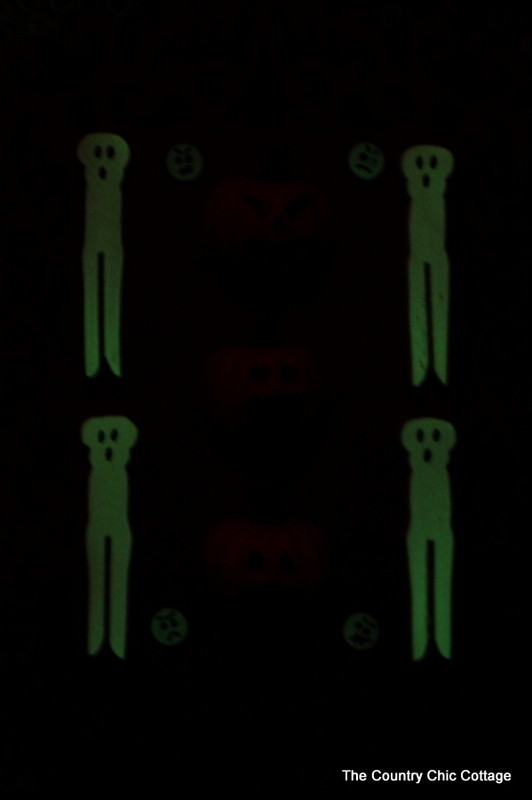 The faces on my ghosts, green monsters, and pumpkin were all drawn by hand using a black Sharpie. 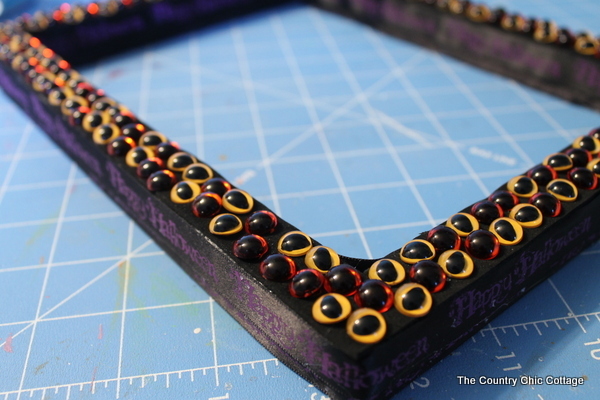 I then used hot glue to add the wood frame to the wreath as well as all of the Halloween items. 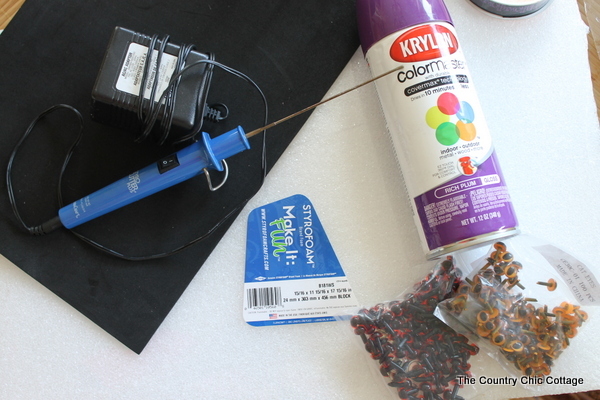 After all of your items have been added, get rid of any glue strings by using a blow dryer on hot. 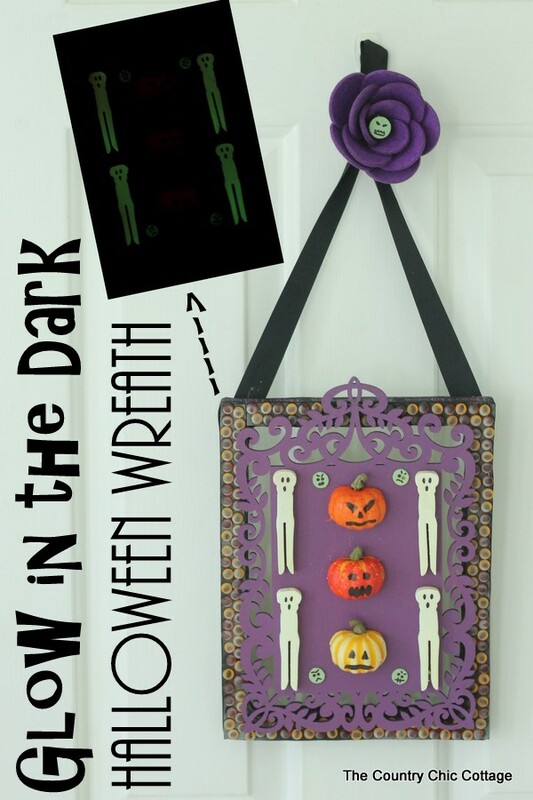 This glow in the dark Halloween wreath is ready to hang and scare the trick or treaters this Halloween! 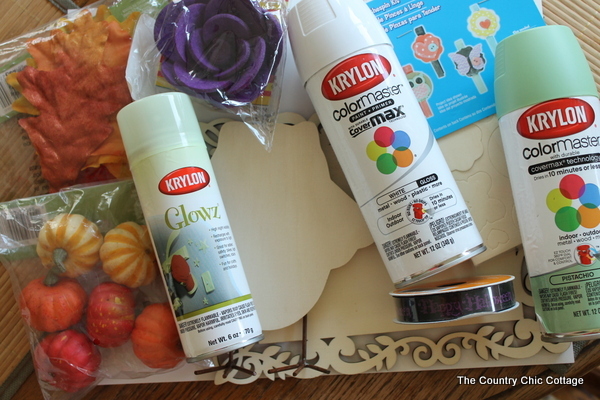 This Krylon mystery box challenge is so much fun. It really gets my creative juices flowing plus I get to use Krylon spray paint….that is what I call a win win. A big thank you to Krylon for sponsoring this post. Y’all be sure to make a glow in the dark Halloween wreath of your very own this year. Get inspired by my version then get creative and change it up to match your style! previous post: Win a Cricut Explore! 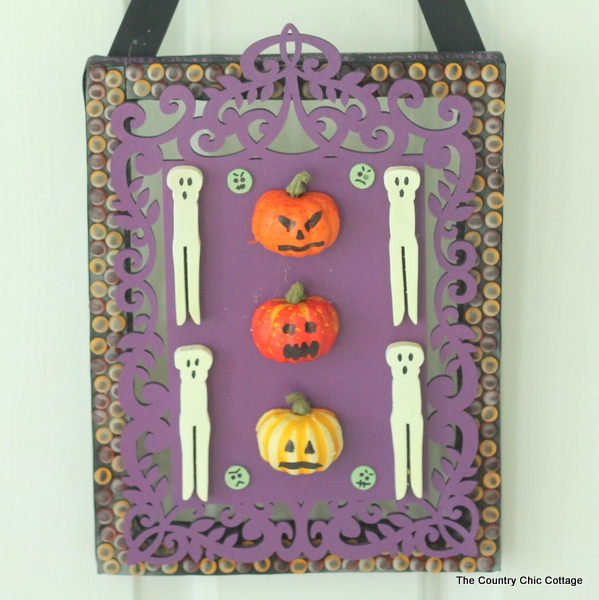 Cute Halloween craft! I’m especially interested in this glowing spray paint – I had no idea it existed! I am such a Halloween fan and this is adorable! I would have never thought to use the clothespins like this!! Love it! So festive! Great job taking on the challenge! I had no idea that they made glow in the dark spray paint! Super awesome idea you came up with! Love that Glowz paint! I’ve always been a sucker for things that glow in the dark, I always buy my kids the glow in the dark t-shirts and everything! what a fun idea!